September 14, 2001 During this strange week of national tragedy, there was something comforting about the steady restoration of an old wooden boat. Penny Hooper of Hooper Family Seafood in Smyrna said, “When I heard about what happened in New York and Washington, I was glad to live on the dead end of a dirt road where I can climb into a clam shell.” Jeff and Jim have made progress on the new deck box, installed directly in front of the galley windshield. This will be used to store dock line, fenders, life jackets, and will also be used as a propane cabinet. A short walk from the deck box brings us to the bow, where Leonard is doing fiberglass repair to the stem. 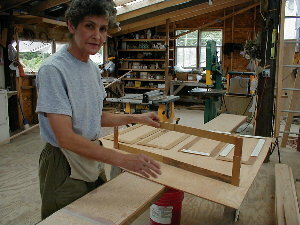 Jeanette is busy as ever cutting risers for the new steps. 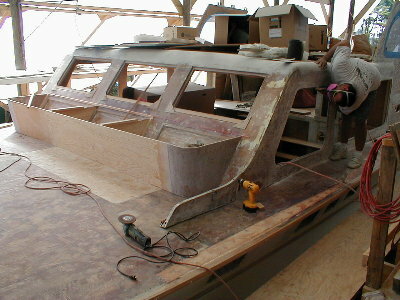 The risers are cut out of quarter inch plywood, and will be epoxied, fared, and painted outside of the boat. Then they will be glued to the surface of the existing risers. The boat interior is looking quite spiffy and white with the newly painted walls in the master and aft guest room. 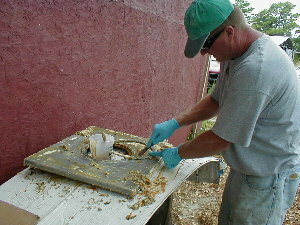 Leonard is removing paint from the original deck hatches, which will be reused. This will save 500 to 1,000 dollars per hatch. Bill Brown and Bud are working hard in the engine room. They’ve constructed a mock-up of the mufflers and generator in an attempt to fit everything in this small engine room. It’s like fitting a size twelve foot into a size ten shoe. 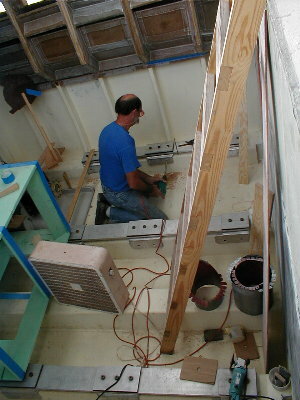 Bill has made his final measurements and is drilling bolt holes for the engine beds. 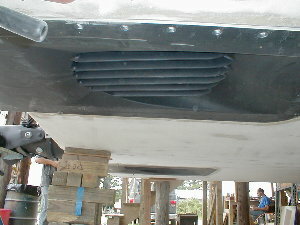 Bud is making the two gutter systems for the air intake boxes. This will drain any water that happens to find its way in to the highly baffled air intakes. Leonard and his crew, Jon Lewis, Bill Davis, and Stuart Wilde, have worked to bring the bottom to a nice fared surface. 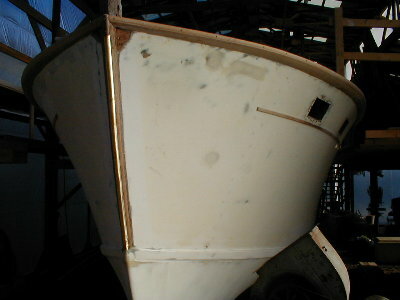 Pictured below is a detail of the chine, showing how the trailing edges have been cleaned up and squared off to give exiting water a clean break from the transom. 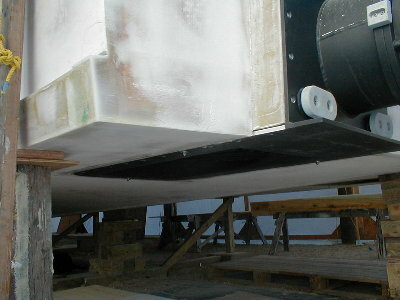 Also below is a view of the waterjets from the bottom, displaying the grillwork which will strain out large chunks of debris that may be sucked into the jets. The jets have been placed in their exact location and all the holes drilled. The next time they come out will be to apply the bedding compound that will seal them into place permanently. At that time the bottom, in the vicinity of the jets, will be carefully fared in to eliminate any turbulance that may occur around the jet intakes. The master head is being built. 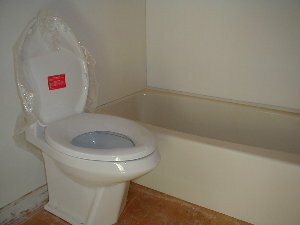 Shown here is the Headhunter Toilet and the RV-sized bathtub (built by jacuzzi). After contemplating the practicality of building the bathtub out of divinycell and then fiberglassing and faring it, a long process that could cost well over a thousand dollars, Bryan located the RV sized tub for under two hundred dollars, and was still able to cut about six inches off it to make it fit the room.